MRI of a 31-year-old man with tuberculosis of the spine. Images show the thoracic spine before and after an infusion of intravenous gadolinium contrast. The abscess and subsequent destruction of the T11-T12 disc interspace is marked with arrowheads. Vertebral body alignment is normal. Courtesy of Mark C. Diamond, MD, and J. Antonio Bouffard, MD, Detroit, Mich.
Progressive bone destruction leads to vertebral collapse and kyphosis. The spinal canal can be narrowed by abscesses, granulation tissue, or direct dural invasion, leading to spinal cord compression and neurologic deficits. The kyphotic deformity is caused by collapse in the anterior spine. Lesions in the thoracic spine are more likely to lead to kyphosis than those in the lumbar spine. A cold abscess can occur if the infection extends to adjacent ligaments and soft tissues. Abscesses in the lumbar region may descend down the sheath of the psoas to the femoral trigone region and eventually erode into the skin. Data from Los Angeles and New York show that musculoskeletal tuberculosis affects primarily African Americans, Hispanic Americans, Asian Americans, and foreign-born individuals. As with other forms of tuberculosis, the frequency of Pott Disease is related to socioeconomic factors and historical exposure to the infection. Although some series have found that Pott disease does not have a sexual predilection, the disease is more common in males (male-to-female ratio of 1.5-2:1). Current treatment modalities are highly effective against Pott disease if the disorder is not complicated by severe deformity or established neurologic deficit. Therapy compliance and drug resistance are additional factors that significantly affect individual outcomes. 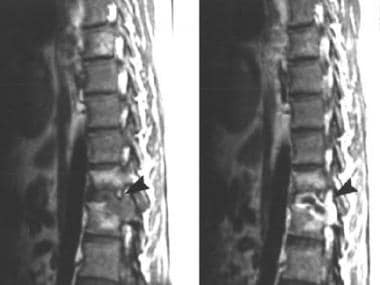 Paraplegia resulting from cord compression caused by the active disease usually responds well to chemotherapy. However, paraplegia can manifest or persist during healing because of permanent spinal cord damage. Operative decompression can greatly increase the recovery rate, offering a means of treatment when medical therapy does not bring rapid improvement. Pott disease is the most dangerous form of musculoskeletal tuberculosis because it can cause bone destruction, deformity, and paraplegia. Pott disease most commonly involves the thoracic and lumbosacral spine. However, published series have shown some variation. [16, 17, 18, 19] The lower thoracic vertebrae make up the most common area of involvement (40-50%), followed closely by the lumbar spine (35-45%). In other series, proportions are similar but favor lumbar spine involvement. Approximately 10% of Pott disease cases involve the cervical spine. Patients with Pott disease should be instructed on the importance of therapy compliance. For patient education information, see the Infections Center, as well as Tuberculosis. Taylor GM, Murphy E, Hopkins R, et al. First report of Mycobacterium bovis DNA in human remains from the Iron Age. Microbiology. 2007 Apr. 153:1243-9. [Medline]. Helen Bynum. Spitting blood. The history of tuberculosis. Oxford: Oxford University Press; 2012. 6-10. Pott P. The chirurgical works of Percivall Pott, F.R.S., surgeon to St. Bartholomew's Hospital, a new edition, with his last corrections. 1808. Clin Orthop Relat Res. 2002 May. 4-10. [Medline]. Murray MR, Schroeder GD, Hsu WK. Granulomatous Vertebral Osteomyelitis: An Update. J Am Acad Orthop Surg. 2015 Sep. 23 (9):529-38. [Medline]. Ekinci S, Tatar O, Akpancar S, Bilgic S, Ersen O. Spinal Tuberculosis. J Exp Neurosci. 2015. 9:89-90. [Medline]. Davidson PT, Le HQ. Tuberculosis and Nontuberculous Mycobacterial Infections. Schlossberg D, ed. Musculoskeletal Tuberculosis. 4th ed. Saint Louis, MO: W B Saunders; 1999. 204-20. De la Garza Ramos R, Goodwin CR, Abu-Bonsrah N, Bydon A, Witham TF, Wolinsky JP, et al. The epidemiology of spinal tuberculosis in the United States: an analysis of 2002-2011 data. J Neurosurg Spine. 2017 Apr. 26 (4):507-512. [Medline]. Handa R, Upadhyaya S, Kapoor S, Jois R, Pandey BD, Bhatnagar AK, et al. Tuberculosis and biologics in rheumatology: A special situation. Int J Rheum Dis. 2017 Oct. 20 (10):1313-1325. [Medline]. Leibert E, Haralambou G. Tuberculosis. Rom WN and Garay S, eds. Spinal tuberculosis. Lippincott, Williams and Wilkins; 2004. 565-77. Dunn RN, Ben Husien M. Spinal tuberculosis. Bone Joint J. 2018 Apr 1. 100-B (4):425-431. [Medline]. te Beek LA, van der Werf MJ, Richter C, et al. Extrapulmonary tuberculosis by nationality, The Netherlands, 1993-2001. Emerg Infect Dis. 2006 Sep. 12(9):1375-82. [Medline]. Benzagmout M, Boujraf S, Chakour K, Chaoui Mel F. Pott's disease in children. Surg Neurol Int. 2011 Jan 11. 2:1. [Medline]. [Full Text]. Moon MS, Kim SS, Lee BJ, Moon JL. Spinal tuberculosis in children: Retrospective analysis of 124 patients. Indian J Orthop. 2012 Mar. 46(2):150-8. [Medline]. [Full Text]. Pola E, Rossi B, Nasto LA, Colangelo D, Logroscino CA. Surgical treatment of tuberculous spondylodiscitis. Eur Rev Med Pharmacol Sci. 2012 Apr. 16 Suppl 2:79-85. [Medline]. Cheung WY, Luk KD. Clinical and radiological outcomes after conservative treatment of TB spondylitis: is the 15 years' follow-up in the MRC study long enough?. Eur Spine J. 2012 May 8. [Medline]. Lifeso RM, Weaver P, Harder EH. Tuberculous spondylitis in adults. J Bone Joint Surg Am. 1985 Dec. 67(9):1405-13. [Medline]. Pertuiset E, Beaudreuil J, Liote F, et al. Spinal tuberculosis in adults. A study of 103 cases in a developed country, 1980-1994. Medicine (Baltimore). 1999 Sep. 78(5):309-20. [Medline]. Turgut M. Spinal tuberculosis (Pott's disease): its clinical presentation, surgical management, and outcome. A survey study on 694 patients. Neurosurg Rev. 2001 Mar. 24(1):8-13. [Medline]. Le Page L, Feydy A, Rillardon L, et al. Spinal tuberculosis: a longitudinal study with clinical, laboratory, and imaging outcomes. Semin Arthritis Rheum. 2006 Oct. 36(2):124-9. [Medline]. Park DW, Sohn JW, Kim EH, et al. Outcome and management of spinal tuberculosis according to the severity of disease: a retrospective study of 137 adult patients at Korean teaching hospitals. Spine. 2007 Feb 15. 32(4):E130-5. [Medline]. Ferrer MF, Torres LG, Ramírez OA, Zarzuelo MR, Del Prado González N. Tuberculosis of the spine. A systematic review of case series. Int Orthop. 2011 Nov 25. [Medline]. Cormican L, Hammal R, Messenger J, et al. Current difficulties in the diagnosis and management of spinal tuberculosis. Postgrad Med J. 2006 Jan. 82(963):46-51. [Medline]. Jellis JE. Human immunodeficiency virus and osteoarticular tuberculosis. Clin Orthop Relat Res. 2002 May. 27-31. [Medline]. Erdem H, Elaldi N, Batirel A, Aliyu S, Sengoz G, Pehlivanoglu F, et al. Comparison of brucellar and tuberculous spondylodiscitis patients: results of the multicenter "Backbone-1 Study". Spine J. 2015 Dec 1. 15 (12):2509-17. [Medline]. Batirel A, Erdem H, Sengoz G, et al. The course of spinal tuberculosis (Pott disease): results of the multinational, multicentre Backbone-2 study. Clin Microbiol Infect. 2015 Nov. 21 (11):1008.e9-1008.e18. [Medline]. Held M, Laubscher M, Zar HJ, Dunn RN. GeneXpert polymerase chain reaction for spinal tuberculosis: an accurate and rapid diagnostic test. Bone Joint J. 2014 Oct. 96-B (10):1366-9. [Medline]. Merino P, Candel FJ, Gestoso I, Baos E, Picazo J. Microbiological diagnosis of spinal tuberculosis. Int Orthop. 2012 Feb. 36 (2):233-8. [Medline]. Amin I, Idrees M, Awan Z, Shahid M, Afzal S, Hussain A. PCR could be a method of choice for identification of both pulmonary and extra-pulmonary tuberculosis. BMC Res Notes. 2011 Sep 8. 4:332. [Medline]. Javed G, Laghari AA, Ahmed SI, Madhani S, Shah AA, Najamuddin F, et al. Development of Criteria Highly Suggestive of Spinal Tuberculosis. World Neurosurg. 2018 Aug. 116:e1002-e1006. [Medline]. Watt JP, Davis JH. Percutaneous core needle biopsies: the yield in spinal tuberculosis. S Afr Med J. 2013 Oct 11. 104 (1):29-32. [Medline]. Weaver P, Lifeso RM. The radiological diagnosis of tuberculosis of the adult spine. Skeletal Radiol. 1984. 12 (3):178-86. [Medline]. Ridley N, Shaikh MI, Remedios D, Mitchell R. Radiology of skeletal tuberculosis. Orthopedics. 1998 Nov. 21 (11):1213-20. [Medline]. Sharif HS, Morgan JL, al Shahed MS, al Thagafi MY. Role of CT and MR imaging in the management of tuberculous spondylitis. Radiol Clin North Am. 1995 Jul. 33 (4):787-804. [Medline]. Ansari S, Amanullah MF, Ahmad K, Rauniyar RK. Pott's Spine: Diagnostic Imaging Modalities and Technology Advancements. N Am J Med Sci. 2013 Jul. 5(7):404-11. [Medline]. [Full Text]. Moorthy S, Prabhu NK. Spectrum of MR imaging findings in spinal tuberculosis. AJR Am J Roentgenol. 2002 Oct. 179 (4):979-83. [Medline]. Almeida A. Tuberculosis of the spine and spinal cord. Eur J Radiol. 2005 Aug. 55 (2):193-201. [Medline]. Jung NY, Jee WH, Ha KY, Park CK, Byun JY. Discrimination of tuberculous spondylitis from pyogenic spondylitis on MRI. AJR Am J Roentgenol. 2004 Jun. 182 (6):1405-10. [Medline]. Sivalingam J, Kumar A. Spinal Tuberculosis Resembling Neoplastic Lesions on MRI. J Clin Diagn Res. 2015 Nov. 9 (11):TC01-3. [Medline]. Lang N, Su MY, Yu HJ, Yuan H. Differentiation of tuberculosis and metastatic cancer in the spine using dynamic contrast-enhanced MRI. Eur Spine J. 2015 Aug. 24 (8):1729-37. [Medline]. Momjian R, George M. Atypical imaging features of tuberculous spondylitis: case report with literature review. J Radiol Case Rep. 2014 Nov. 8 (11):1-14. [Medline]. Mittal S, Khalid M, Sabir AB, Khalid S. Comparison of Magnetic Resonance Imaging Findings between Pathologically Proven Cases of Atypical Tubercular Spine and Tumour Metastasis: A Retrospective Study in 40 Patients. Asian Spine J. 2016 Aug. 10 (4):734-43. [Medline]. Zhang X, Ji J, Liu B. Management of spinal tuberculosis: a systematic review and meta-analysis. J Int Med Res. 2013 Oct. 41 (5):1395-407. [Medline]. Rajasekaran S, Prasad Shetty A, Dheenadhayalan J, Shashidhar Reddy J, Naresh-Babu J, Kishen T. Morphological changes during growth in healed childhood spinal tuberculosis: a 15-year prospective study of 61 children treated with ambulatory chemotherapy. J Pediatr Orthop. 2006 Nov-Dec. 26 (6):716-24. [Medline]. Blumberg HM, Burman WJ, Chaisson RE, et al. American Thoracic Society/Centers for Disease Control and Prevention/Infectious Diseases Society of America: treatment of tuberculosis. Am J Respir Crit Care Med. 2003 Feb 15. 167 (4):603-62. [Medline]. Li L, Zhang Z, Luo F, Xu J, Cheng P, Wu Z, et al. Management of drug-resistant spinal tuberculosis with a combination of surgery and individualised chemotherapy: a retrospective analysis of thirty-five patients. Int Orthop. 2012 Feb. 36 (2):277-83. [Medline]. Controlled trial of short-course regimens of chemotherapy in the ambulatory treatment of spinal tuberculosis. Results at three years of a study in Korea. Twelfth report of the Medical Research Council Working Party on Tuberculosis of the Spine. J Bone Joint Surg Br. 1993 Mar. 75 (2):240-8. [Medline]. Wang Z, Shi J, Geng G, Qiu H. Ultra-short-course chemotherapy for spinal tuberculosis: five years of observation. Eur Spine J. 2013 Feb. 22 (2):274-81. [Medline]. Jain AK. Tuberculosis of the spine. Clin Orthop Relat Res. 2007 Jul. 460:2-3. [Medline]. Watts HG, Lifeso RM. Tuberculosis of bones and joints. J Bone Joint Surg Am. 1996 Feb. 78 (2):288-98. [Medline]. Tuli SM. Tuberculosis of the spine: a historical review. Clin Orthop Relat Res. 2007 Jul. 460:29-38. [Medline]. Yang P, Zang Q, Kang J, Li H, He X. Comparison of clinical efficacy and safety among three surgical approaches for the treatment of spinal tuberculosis: a meta-analysis. Eur Spine J. 2016 Mar 31. [Medline]. Moon MS. Tuberculosis of the spine. Controversies and a new challenge. Spine (Phila Pa 1976). 1997 Aug 1. 22 (15):1791-7. [Medline]. Cui X, Ma YZ, Chen X, Cai XJ, Li HW, Bai YB. Outcomes of different surgical procedures in the treatment of spinal tuberculosis in adults. Med Princ Pract. 2013. 22 (4):346-50. [Medline]. Meena S, Mittal S, Chowdhary B. Spinal tuberculosis: which is the best surgical approach?. Med Princ Pract. 2014. 23 (1):96. [Medline]. Tuli SM. Historical aspects of Pott's disease (spinal tuberculosis) management. Eur Spine J. 2013 Jun. 22 Suppl 4:529-38. [Medline]. Kapoor S, Kapoor S, Agrawal M, Aggarwal P, Jain BK Jr. Thoracoscopic decompression in Pott's spine and its long-term follow-up. Int Orthop. 2012 Feb. 36 (2):331-7. [Medline]. Gupta AK, Kumar C, Kumar P, Verma AK, Nath R, Kulkarni CD. Correlation between neurological recovery and magnetic resonance imaging in Pott's paraplegia. Indian J Orthop. 2014 Jul. 48 (4):366-73. [Medline]. Jutte PC, Van Loenhout-Rooyackers JH. Routine surgery in addition to chemotherapy for treating spinal tuberculosis. Cochrane Database Syst Rev. 2006 Jan 25. CD004532. [Medline]. Agrawal V, Patgaonkar PR, Nagariya SP. Tuberculosis of spine. J Craniovertebr Junction Spine. 2010 Jul. 1 (2):74-85. [Medline]. MRI of the T11 in a 31-year-old man with tuberculosis of the spine. Extensive bone destruction consistent with tuberculous osteomyelitis is evident. The spinal cord has normal caliber and signal. No evidence of spinal cord compression or significant spinal stenosis is distinguishable. Courtesy of Mark C. Diamond, MD, and J. Antonio Bouffard, MD, Detroit, Mich.